The Bennett brothers have always been known for their outgoing personalities which is a good thing because a lot of athletes are to media trained, but definitely not these two. 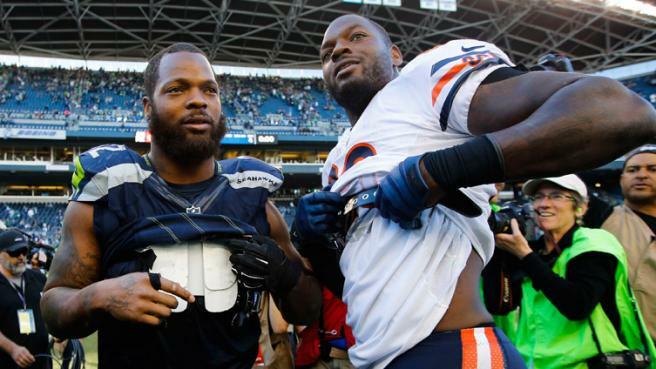 Michael is still representing the Seahawks franchise as one of the league's best pass rushers and Martellus has recently joined the Patriots after being traded from the Bears this offseason. Not many siblings have made it to the elite level in football, well not in any sport really. The Barbers, the Mannings and the Pounceys have all done it alongside the Bennetts in the NFL. Jay Cutler - "Worst quarterback in the NFL," he says. "I'd be open and he'd throw into double coverage," says Martellus, who spent the past three seasons as Cutler's teammate in Chicago. Roger Goodell - "A--hole. Nah, I'm just joking -- you can't say that. Overpaid." Tom Brady - "The silver fox you never get to see but you hear about. You only get to take one photo, and you have to stay outside for a year just to get it." I think it is great that you have a couple of players like this who show such personality and don't really mind what they say because it makes the NFL more entertaining and it's refreshing. The whole sport would be boring if we let people like NFL commissioner Roger Goodell dictate our every move, so it's good to see a bit of change. Although you never know he could give you a 4 game ban for commenting on Sam Bradford's hair or something like that. You can obviously see these two brothers are big characters and have a really close bond which is great to see, in sports you don't often see it. Hopefully, in terms of Martellus though, this huge personality, can turn into huge productivity this season for the Patriots.